Top performance horse veterinarian Kurt Heite, DVM, offers tips for choosing a prepurchase exam veterinarian. Ask your trainer and/or reputable trainers in your chosen event for their recommendations. Choose a vet who specializes in what you want to do, and who does a lot of PPEs. For instance, if you're buying breeding stock, hire a vet who's a breeding expert. 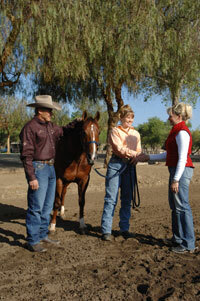 If you're buying a performance horse, find a vet who specializes in performance horses. Contact the American Association of Equine Practitioners, and ask for a performance horse vet in your (or the seller's) area. Go to aaep.org/horse-owners/get-dvm, or call 859-233-0147. Contact your regional equine veterinary school and ask for recommendations. Pick a vet who can communicate on your level, meaning one that you're comfortable talking to. You want him or her to be able to break down any findings into layman's terms. And, you especially want to be able to ask any and all questions that occur. Try to avoid using the seller's and/or horse's regular veterinarian, if possible, to avoid a potential conflict-of-interest situation.